"To The Ends Of The Earth" - Mary Beth Beuke - Sea Glass travels and photo collage. What can I say? 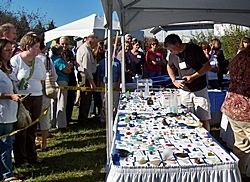 It was the first sea glass festival I had been to. I never dreamed there were so many fanatics. Wow. They said Saturday they had more people through the door than they did for both days at the sea glass festival in Santa Cruz last year. It surprised everybody. It was a crunch. When we got to Sea Glass Festival 2008 in the morning or I should when say we drove by first thing in the morning, there was a long line of cars trying to get in to park and lots of people standing in line to get in. We decided to come back later. My mom and I don't handle crowds very well. 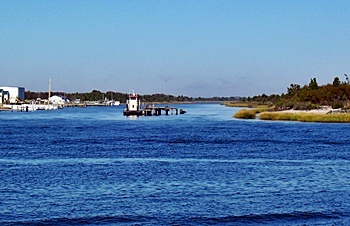 We drove by Cape Henlopen and walked down to the beach and then went to Ocean Pines, which is south of Lewes, Delaware. We wanted to scope out some galleries that my mom was interested in for her artwork. When we finally got to the festival at Virden Center…………..
A lot of the lectures at the sea glass festival on Saturday sounded very interesting but time didn't allow us to get to them all. Here are a few notes from the ones we did attend. 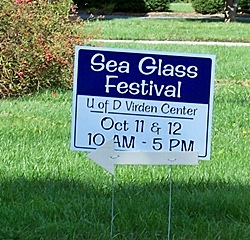 For us, this was one of the highlights of Sea Glass Festival 2008. Mary Beth had a photographic collage of some of her sea glass hunting experiences. She showed pictures of a recent trip she made to the Big Island, Hawaii, and sea kayaking around San Francisco with The Travel Channel. She also talked about how she gained a love for sea glass. I remember her talking about the time when her girl was about three years old. She was putting her to bed for a nap and her little girl pulls out a yellow trade bead to show her. Mary Beth asked her where on earth she found that and the little girl said right out in front of where they live on the beach. Mary Beth had a picture of it. It was gorgeous. She also had a photo of a red die. What was amazing (to me since I have never found one) is that while Mary Beth was showing the slide, the gal in front of us holds up a green die to show Mary Beth. Mary Beth found hers on the West Coast and this gal found hers on the East Coast. And as always, her photos were beautiful. One of these days, maybe I'll be in the right place at the right time to be able to find a trade bead or some dice to show at a sea glass festival. I'll keep hoping and looking. This was also one of the highlights for me at the Sea Glass Festival. Celia was the one who did the photos for Richard LaMotte's Book "Pure Sea glass". When Richard LaMotte and his wife approached Celia to do the photography for the book, she had never taken pictures of sea glass before. She ended up doing a lot of experimenting. This was her first sea glass festival. She had slides of some of her photos of sea glass and gave us tips on how she did them. Sea glass has its own light. It's an abstraction of the form it comes from - the history - on a journey and has been transformed and reduced to its core. Sea glass holds memories for many. She stated, "Hunt for sea glass and it will change your life". She likes using natural light whenever possible for her source of light. Reflectors can be an effective tool. Recommends low ISOs and a tripod when shooting indoors. Focus in on one thing in your composition. Photo: Had the effect of 2 red pieces of sea glass looking like they were falling through water. How she achieved this: Took a clear glass vase on its side and placed a piece of the sea glass on top of this. The design in the vase gave it that floating-down-through water effect. I'm not positive but I think she placed the other one below (didn't write this part down in my notes). Photo: She placed sea glass on a clear piece of glass but had put sand underneath the clear piece of glass, and it made it look like the sea glass was suspended. Photo: Sea glass that looked like it was in water: She put the sea glass on a mirror and poured a little bit of water on it. She said she had to really fight with the reflection coming off the mirror but the effect was absolutely stunning. You may end up with reflections - either move the composition to get rid of them or use them. Depends on what you're trying to achieve. Photo: Sea glass on top of sand: She dropped the sea glass into the sand to give it that "just found" look. Mentioned that sometimes photographing sand can be a problem. The sand from the Chesapeake (it can be kind of yellowish) came out looking like mud in photos. She experimented with different sand (some store bought) - mixed it with kosher salt - some she mixed with corn meal (white or yellow). Bottom line - Experiment. Photo: Sea glass was balanced on top of ridges in sand. It looked like someone had raked wet sand with those swirls that a rake will leave. She used a glass plate with grooves in it, sprinkled sand over it, and then placed the sea glass on top of that. The effect was that it looked like somebody had raked the sand and the sea glass was on top of those ridges. Very interesting. Experiment, don't be afraid to play around with your compositions. Try using rich paper, textured objects, semi-transparent materials. Try placing a piece of clear glass over the paper or material and see what you come up with. Bottom Line: Go beyond the expected and see what you come up with. Stretch your wings and experiment with different materials, different lighting, while using good photographic technique. Ready to take some photos of your sea glass? At the sea glass festival today, Richard kind of did a run through on the development of glass. * He talked about color, lips, necks, shoulders, sidewalls, heels, bottoms (pontil marks), thickness. * There are certain identifications one can look for and estimate the years that possibly a piece of sea glass came from. * The lips of bottles as well as the necks, shoulders, sidewalls, heels, and bottoms all went through changes over the years. Maryland Glass produced the cobalt. Lime sea glass is from the 50's and 60's. Black glass will be riddled with bubbles inside and out (take a flashlight to it and you will see this). Bubbles mean not manufactured, hand blown. A lot of bubbles - probably 1800's. Less bubbles, early 1900's if without ribs or modern lips. Black produced with iron slag. Gray color glass - thick and chunky - leaded tableware. Lavender glass - 1875, pre-1915. Started out as clear glass. The amount of manganese affects how purple the glass becomes. Darker pink glass - tableware. Lighter pink glass - 1915-1930. Used selenium in clear glass because it was cheap. Orange glass - vanity glass. Red glass - Some tableware, could be from warning lights on ships, brake lights, lanterns, et cetera. Vaseline glass - uranium glass. To see if you have a piece of this use a black light on it and it will glow. Post prohibition bottles - 1933-1964. Atlas mason jars - 1930-1940's. Mentioned insulators, light bulb insulators, layered glass, ruby stain glass, pressed glass, art glass, floats. Glass production varied from batch to batch, may not always be exactly the same. Have to consider the wear (wave action), the amount of silica, soda, and lime. A lot of rare shards come from tableware. Thick diameters usually were jars. Milk jars - thick lips with an inside ring where they placed the pull-away top (This was cool because it helped us identify a piece of milk jar my mom had). Aqua bottles aren't automatically Coke bottles, a lot of aqua bottles were produced in the 1900's. Some beer bottles were aqua. Ribs- Coke bottles with ribs (greenish color)started in 1915. In 1900's, they started using automated machines to make glass. Post-1910-1915- crown seals, metal tops. Necks - stripes up under collar - hand-tooled (stretch marks of glass). Thin long necks usually from medicine bottles. Pickle bottles - lower collar and wide lips. Strap flask - large band down the sides like Milk of Magnesia. Bottle bottoms - open pontile scars from pre-1860, kickups from late 1800's, base molds - 2 piece molds - key mold late 1800's, early 1900's. Text on bottoms late 1800's. Talked about what some of the symbols on glass mean. Sorry I can't show you but if you do a search, you can find that information on the internet. One can learn a lot by studying antique glass and bottles or knowing where to go for references to help you to narrow it down. Granted some pieces of sea glass you will not be able to identify the year it came from or even what it came from but for those ones that you can, it's like solving a mystery. So, again, a fine example of the type of valuable information that one could likely only find at the Sea Glass Festival 2008. Wow. What an experience. 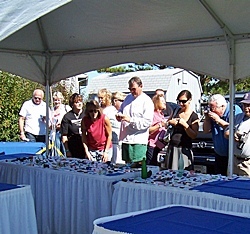 It was great to be with so many enthusiastic sea glass fanatics in a very laid-back atmosphere. The camaraderie was great. Everybody was eager to share experiences and to show off their prizes. We heard about a gal that had sea glass from Italy and they said it was absolutely stunning. Unfortunately we never ran into her. My mom wanted to get a shard identified and we were in the line for Shard Identification. The gal behind me pulled out a jewelry case and opened it up. My eyes almost popped out of my head. In there was a very delicate, totally frosted and intact bottle stopper. Looked like it might have belonged to a perfume bottle. It was gorgeous. There was a couple there that wasn't selling anything. They were simply sea glass enthusiasts who wanted to share their collection and her "babies" (those very special pieces we all have). The craziest thing of all is that she is from my neck of the woods and in the teeny, tiny town below where we live (Bow, WA), her grandmother used to have a house. We have visited some of the same beaches. Small world, eh? 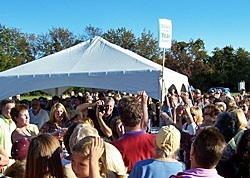 Everyone at Sea Glass Festival 2008 was quite enthusiastic about all the events...So, the Sea Glass Association has voted to have the 2009 Sea Glass Festival in Erie, PA next year the weekend of ----- at the -----. Will you be going? Think about all the wonderful sea glass, beach glass, mermaid tears, nature's gems, seaglass, beachglass, call it what you will or spell it how you will that folks will find between now and then. REALLY INTERESTING - See many photos in our gallery of Sea Glass Catch of the Day Photos!